(Nanowerk News) Researchers from Universidad Politécnica de Madrid (UPM) have produced the strongest spider silk fiber so far. They used a technique that made popular the silk from Murcia in the 19th century. Given the good properties of this new material, this silk can be used for regenerative medicine. Following the same procedure used to fabricate the hijuela in Murcia two centuries ago, which is a strong thread from silkworm, researchers from the Center for Biomedical Technology (CTB) at Universidad Politécnica de Madrid (UPM) have found a way to successfully produce the strongest spider silk fibers up to now. This new fiber was called hijuela de araña and its diameter is significantly greater than the natural fiber maximizing the load that can withstand before it breaks. This new feature along with the interesting mechanical and biocompatibility properties of the spider silk make this new material a suitable application for regenerative medicine. 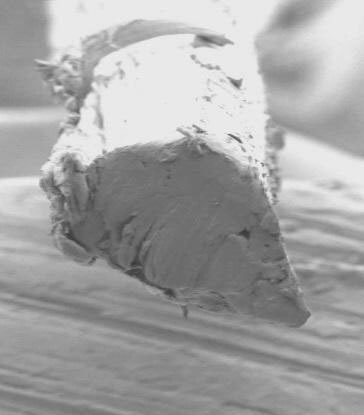 Fracture surface of the spider silk. Throughout the 19th century, the region of Murcia specialized and was famous for the production of hijuela, a very strong thread from silkworm. The traditional process consisted on using an acid liquid medium, generally water and vinegar, and to deform the silk glands where worms produce the proteins in the mentioned liquid. The hijuela used to be very strong and was used for fishing and sutures. Now, researchers from the group of Advanced Structural Materials and Nanomaterials from the ETSI Caminos, Canales y Puertos Engineering and CTB at UPM, experts in biomaterials and their application to regenerative medicine, have used this technique to make the strongest spider silk fiber up to now, and they have named as hijuela de araña. This study has been recently published in the Scientific Reports journal ("Spider silk gut: Development and characterization of a novel strong spider silk fiber"). Researchers extracted the silk glands of spiders of the species Nephila inaurata, native to southern Africa and Madagascar. By deforming these glands into an acid medium, researchers were able to obtain fibers with significantly larger diameters than the natural ones, and they were also able to optimize the conditions to maximize the strength of fibers. This work is part of a line research that aims to obtain silk-based biomaterials for biomedical applications. Silk is indeed a biomaterial with excellent mechanical properties and great strength and deformability. Besides, by using the available biotechnological techniques is possible, in principle, to obtain artificial silks with improved properties like the ability to facilitate cell adhesion for applications such as scaffolds for regeneration of damaged tissues. Working with hijuela de araña allowed researchers to gain better understanding of the procedures for obtaining these materials. Besides, the great cross section of the hijuela de araña means that it can support a much higher force than natural silk fiber. This property suggests that natural silk could be replaced in some biomedical applications, such as biomaterials for tissue engineering.